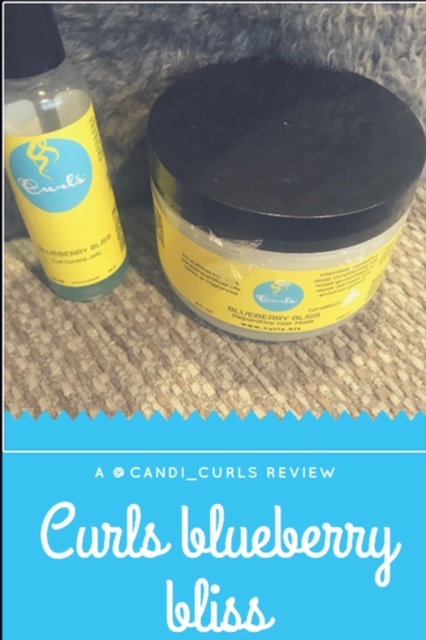 While on holiday in September with my friend Keisha, i finally got to try the Curls Blueberry Bliss curl control jelly. This brand has been on that ever growing list for ages, and i was excited to try it out. I was not disappointed! "Got frizz? 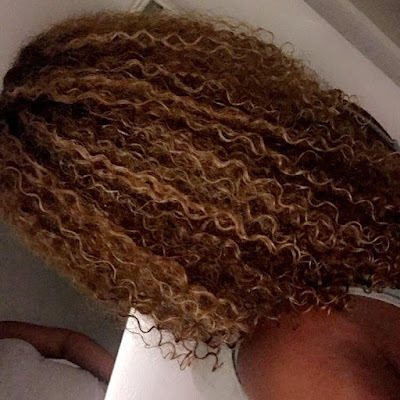 Need curl definition and hold? Formulated with certified organic blueberry extract and hydrogenated Castor oil, this hard working styling jelly is your go to product for long lasting, shiny curls!" On the bottle the product is described as being a "jelly based styler used to defrizz, define, hold and create curls in place with impeccable sheen." I was surprised at the texture of this one at first, it really is a jelly! I have never used something like this in my hair and i know my hair has a love-hate relationship with gels, but i needn't have worried. As soon as i applied this gel to my hair the result was almost instant. My curls were shiny, defined and they lasted the whole night even in the hot weather of Turkey. I had higher expectations on the smell of this but i like it all the same. It reminds me of the scented bubble baths you used to get as a kid for Christmas in gift sets with glitter bits? Maybe that's just me. The directions for this one have a day 1 and a day 2 method. This shows the brands confidence in making sure that you get the most out of this product to me. On day 1 it says to apply this onto freshly washed and conditioned hair while it is still wet, and to scrunch into hair before letting it air dry. On day 2 it suggests refreshing with some of the other products in the line, and applying this jelly last. I have become a fan of the praying hands/smoothing method when applying product, so i don't scrunch this into my hair, but it works just the same. As suggested on the bottle on day 2,5 and 7 when i refresh my curls, i do the usual LCG (Leave-in, Cream, Gel) or LCGO (Leave-in, cream, gel, oil) method using the jelly as you would a gel. Because this is thick like a jelly, you really only need a small amount which is always a plus. I would highly recommend this product to anyone! After i got back off my holiday it was one of the first products that i purchased and i absolutely love it! My love of it got me to try another from the brand. Blueberry Bliss reperative hair mask. I love a good hair mask. Using these weekly is how i managed to turn my hair around and get it to a much healthier state. When choosing a mask, i go off brands who i have used before and trust or recommendations by hair gurus. I have seen this one in so many of the videos and posts that these curlies do on instagram, and because i loved the jelly so much, i trusted them. Again i am so glad that i did. "Intensive reperative deep condition hair mask guaranteed to repair damage and enhance growth." "Soften, detangle, moisturise, condition and hydrate your curls while repairing damage, protecting against breaking and encouraging hair growth." This brands whole plan, seems to centre around encouraging hair growth, and i love it! Alot of other brands just talk about strengthening and hydrating etc and not actually aiding to grow your hair, so this is different to me. This has that same blueberry smell that this line is famed for, and is creamy in texture. Again, like the jelly, it was an almost instant reaction to the product that my hair had. As soon as i applied it to the first section the curls bounced back faster than any other deep conditioner. I left this on for 15 minutes under my hot head and then an extra 5 minutes without heat. The directions on the tub say 15-25 minutes so i was right on track for this. My hair was super soft! I rinsed the mask out and the result was insane. My hair was the softest it had been in a while and so shiny. I styled my hair for bed adding some cantu leave in repair cream and boucleme curl cream and gel, before applying the blueberry bliss control jelly into the two sections. When i woke up that next morning my hair was exactly the same as it was before i went to bed! I got to day 7 with this wash day using the mask, i could have gotten further, but i only get 1 day off a week, and we all know about scheduling wash days haha. I actually couldn't wait to use this mask again, and when i did today, i got the same amazing result! Again i have restyled using the same Leave-in, adding the curl activator also by cantu and finally the curl control jelly. I sometimes diffuse my hair, but the jelly says to air dry, so following that has made a difference to my curls. The method i used to apply it (praying hands/smoothing) has also helped to elongate my curls, where diffusing would make the shrinkage more. The results after the first time using the curl control jelly, my curls stayed intact all night even in the hot weather of turkey and dancing the night away in the clubs.